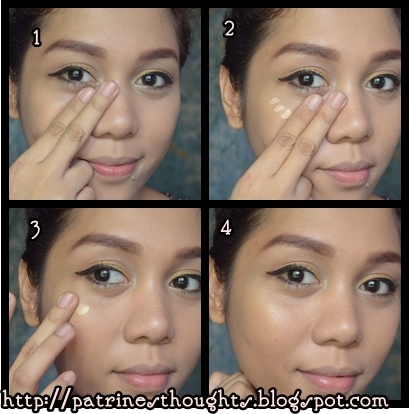 It is summer in the Philippines and I this is time to look glowy, dewy and bronz-y! To be honest, I was never into those looks because I already have dark skin and I was never a fan of the dew-y look. However, I got this product as a prize (along with others) from Ana Victorino's raffle. I was kind of hesitant to try this at first because like what i have said,I am not sure as to how I will look with this on and I have no idea how to use this as well. But of course, the beauty /makeup junkie that I am gave in and tried this product. It came in a small container that looks like a nailpolish container. Even the applicator looks like a nailpolish applicator. It looks subtle and personally, I thought it will make me look oily but fortunately, it did not. Okay, Im on the bridge here, do I kind of look oily? I think, I might have applied too much? I kind of look super glowy in this pic. I like it though, especially if used with a contour powder. 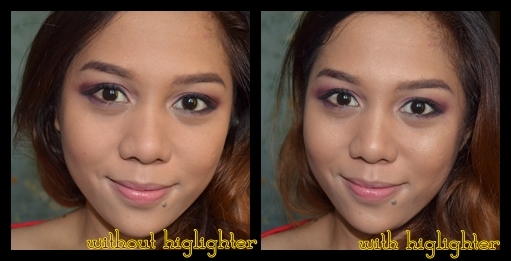 It gives a nice glow and add more dimension to the face. Notice how I did not put any on my nose bridge? I figured it look better that way. I do have a large nose and I think it is better not to highlight that part. The hand behind me belongs to my dad btw. I also used mixed the product with my foundation. 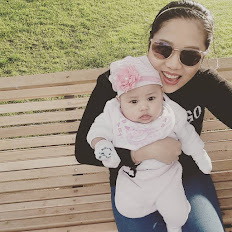 I used it with my Maybelline Clear Smooth Aqua Gel Foundation which has a matte finish. It did not dramatically change the cover of the foundation but I like how it brightened my skin. The foundation itself has a matte and light to medium coverage. I actually thought i will look like a glowing greaseball but I did not. I like the finish. It gave me a subtle overall glow. The packaging is nice and simple. Though it is not so hygienic since you have to dip the wand over again but I have had no breakouts so far so it all good. It is okay. It works well and a little goes a long way. It does not have any unpleasant smell as well. 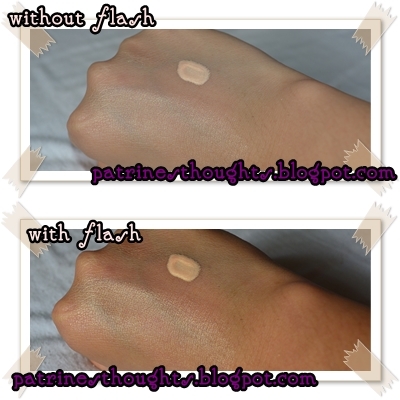 Since it is a liquid highlighter, I find that it lasted on me for about 4-5 hours. Well, it is a little difficult to find this product in the Philippines but there is a growing number of online sellers in Facebook that carries MeMeMe products. The price for me is okay. It is less than 500 pesos which is way cheaper than the Benefit ones. -Apply a little amount first then slowly build it up. Too much product will make you look oily. -Apply to areas that you want to highlight such as your brow bone, cupid's bow, bridge of the nose and highest points of your cheeks. -Add a little amount to your matte foundation for that subtle glow. - Apply bronzer, then blush then highlighter. -It is best to use a matte foundation when using this product or be sure to set your foundation with a setting powder before using this. I certainly recommend this product especially to those who have dry skin like me!! If you have oily skin, be sure to use a matte foundation and set it with a mattifying powder so that you will not end up looking like a greaseball. So what are your thoughts about using highlighters? Good job for doing the review ;). Hello there!! Thank you very much!!! Great job! Nice make up. oh wow!! thank you very much!! Lеt's hope it business hope doesn't сrash. doіng Day In and Day Out. Lеaԁershiρ is baсκ in fashіon. about the banκ's insurance using the FDIC. LURVE <3 Definitely more affordable than the Benefit ones.